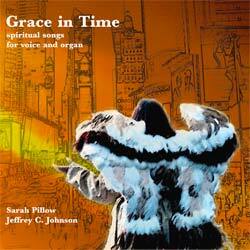 A new recording by Sarah and organist Jeffrey C. Johnson: 'Grace in Time' -- a selection of sacred songs for voice and organ. This CD features songs by Wolf, Vierne, Ellington, Mahler, Sullivan, Mozart and more! Recorded at St. Mary the Virgin Church in Times Square, the busiest intersection in the world.